Agreed, I wasn’t even going to try the coleslaw because, ewwww, coleslaw… but I’m so glad I did. It was downright delicious. Who would have thought? yeah i can’t get over how good that stuff was. i mean i enjoyed everything but i think i ate a full plate of that slaw in total. I had a great time at Flore today. I wish they had BBQ tofu as well or something in that vein. But it was still very good. That’s a gorgeous plate of food. I wanna reach right over and try that mac and cheese. I really want to try some of that mac n cheese, it looks so good and I’m in need of some comfort food. 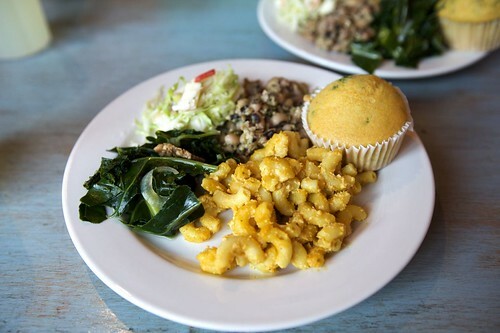 That soul food plate looks so good and reminds me of home! Yum! gah, i was out of town for this–so bummed! they better keep up these all you can eats! ill be there every friggin weekend! They’re doing it again tomorrow. And they added bbq tofu. Yum. funny you say that because BBQ tofu is on the menu for today’s all you can eat soul food buffet! Wowsa! This sounds FANTASTIC! !Do you know if they have soul food EVERY weekend or just that weekend?? I am feeling SICK to have missed it (mac n cheese is one of my all time faves & finding a great vegan one would e like finding the actual holygrail!!) anyhoo, thanks so MUCH for the heads up!!! I’m loving this!! I want that mac and cheese right now!